Home Community City Get Your Game On! On any given weekday, the busiest place in Bicentennial Park is not Adventure Alley or the new baseball fields. The action is on the 19 outdoor courts at Southlake Tennis Center, tucked away in the southwest corner of the park (near Southlake Boulevard entrance). As the second largest public tennis facility in Tarrant County, Southlake Tennis Center is open seven days a week to both residents and non-residents for a minimal court rental fee. The goal is to make tennis accessible and affordable to all. The efforts have not gone unnoticed. 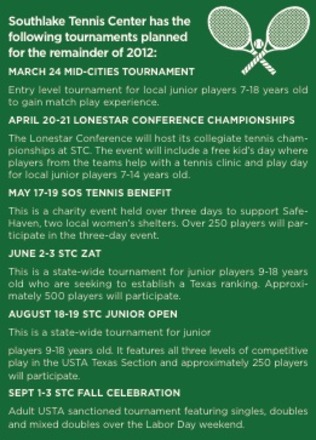 Since opening in October 1999, Southlake Tennis Center has hosted more than 100 local, state and national sanctioned tournaments; instructed several thousand junior and adult players; and won multiple awards recognizing its tennis programs, professionals and playing facilities. Built and owned by the City of Southlake, there are no membership fees or monthly dues required to play at Southlake Tennis Center. Courts are available for rental on a two-hour basis at a cost of $4.00 for residents and $5.00 for non-residents. Constructed to maximize viewing and player enjoyment, the original 13 lighted courts surround a circular center court stadium that is accessible from both the east and west, with tiered levels for viewing. Six courts were added in 2010 in two banks of three to maximize land use. Each pair of courts has a bench with a shade structure and water jug, and individual courts have benches with umbrellas. The result is an award winning facility (see sidebar) that accommodates a variety of play and spectator viewing. A 1,500 square foot pro shop stays well stocked with tennis equipment and accessories, including brand name apparel, shoes, bags, and racquets from Head, Wilson, Prince, Babolat, Nike, and several other lines. Services also include assistance choosing the right racquet and 24-hour turnaround on re-stringing. According to Mia Gordon-Poorman, who manages Southlake Tennis Center with her husband, Stephen, on a contract basis with the City, the facility represents a unique partnership that allows them to offer the best programs, teaching professionals, and pro shop in the area. "Unlike most public facilities, the staff is not hired by the City and the pro shop is independently owned and operated. This has created an incentive for us to maximize the use of the facility and to offer more creative programming than you might find at other public tennis centers," says Gordon-Poorman. "The City does a wonderful job of maintaining the facility so that it feels more like a private club. Our amenities and programs mirror a country club more than a public facility, with an activity level that is on par with much larger facilities such as Arlington Tennis Center and High Point in Plano, while drawing on a significantly smaller population base." quality of instruction at Southlake Tennis Center, his role in charity events, and the expansion of the facility. "Tennis is a year round sport in Texas, so we make sure our schedule accommodates both the person who takes a lesson once a week, as well as the player training for tournaments," Poorman explains. "One of the best things about tennis is it can be an individual or team sport, depending on the player's skill and preference." Whether you are a beginner or have been playing for years, Southlake Tennis Center has a program to suit your ability and take you to the next level. A variety of adult leagues are offered based on the player's current NTRP rating or the level you would play USTA matches/tournaments. Another feather in Southlake Tennis Center's cap is being named the 2011 QuickStart Facility of the Year by the Texas Section of the USTA for its trailblazing use of the QuickStart program, a format designed specifically for 10 and under players. Endorsed by many of the top tennis players in the world including Roger Federer, Pete Sampras, Jim Courier, Raphael Nadal and Todd Martin, QuickStart is designed to help kids enjoy playing tennis while giving them a base of the correct fundamentals. According to Poorman, the QuickStart program ensures children learn to play tennis correctly from the beginning by using modified courts, balls and racquets to teach correct technique while having fun. In Southlake, the game of tennis is more than a competitive sport or recreational activity. It has also proven to be an economic generator, bringing 2,350 non-local players to Southlake during 2011 and generating $479,250 in local revenue. Of the eight tournaments played at Southlake Tennis Center during 2011, the most notable was the Texas Section Mixed Doubles playoffs September 30-October 2, which included 800 players and an estimated economic impact of $375,000. In addition, many of the players went to Southlake Town Square for the annual Oktoberfest celebration. "We have found that tournaments are an excellent way to raise the profile of the Tennis Center and to showcase the City of Southlake. We work very hard to create additional benefits for the community, beyond the game itself," explains Gordon-Poorman, adding that tournament players are given visitor information guides and encouraged to shop and eat in Southlake. "The City recognizes the value of the large tournaments that have been brought to Southlake as a result of our outstanding programs and industry relationships." According to surveys conducted by the USTA on the spending habits of tennis players at tournaments, it is estimated that an adult player spends $350 per tournament, including lodging. On average, players spend approximately $50 per day while traveling to tournaments, not including lodging. These cost estimates are for players' expenses only and do not take into account a multiplier effect. "Based on this survey research, we estimate the economic impact of our tournaments to be nearly $500,000," Gordon-Poorman states, noting this does not include court fees for the 20,000 residents and other locals who use the tennis facility throughout the year. "We always tout the health, fitness and social benefits a tennis facility brings to a community, but the economic impact is often overlooked." "At Southlake Tennis Center, we take the game seriously, but we also like to have fun! This is why we offer something for everyone -- adults and juniors, beginner and advanced levels, and competitive and recreational players. There is no excuse not to play tennis," states Gordon-Poorman. "Although we are a public facility, we offer the same high caliber programs and professional instruction as a private club, which is a perfect fit for this community." Tracy Southers is president of WordPlay, a public relations agency in Grapevine, Texas. The company’s services include consulting, copywriting, marketing campaigns, publicity, social media training, and special event planning. For more information, call (817) 756-1233 or email tracy@wordplayinc.com.